It's a well-established fact that New York remains a magnet for jazz musicians from all over the U.S. For years Chicagoans have migrated east to be in the thick of it—the heart of the jazz industry, if not its creative center. Greg Ward, Marquis Hill, Christopher McBride, and Milton Suggs are just a few examples of local talent that are no longer local. But it's not just Americans that flock to the Big Apple—players from all over the globe gravitate there. The competition tends to force players to step up their game, and that certainly seems the case for the impressive Spanish pianist Marta Sánchez, who grew up in Madrid but now resides in New York. Earlier this year she released Partenika (Fresh Sound New Talent), her third album, but her first made on American soil with players from New York. Of course, both saxophonists in the frontline of her quintet are foreigners, too—tenor saxophonist Jerome Sabbagh is French, while alto saxophonist Román Filiú is Cuban—but together they form a sound that feels thoroughly New York-ish, wherein countless streams and traditions commingle. In an online interview published by jazzspeaks.org Sánchez says she wrote the album's eight pieces with these musicians in mind—a pretty common conceit for jazz composers these days—and rather than focus on improvisation built around melody and chord changes, she emphasizes individual lines and counterpoint. As she said in the same interview, "There aren't that many chords, I think more in terms of lines that go together. It's not about people playing chords and a melody, a melody and harmony. It's many melodies in many layers, all happening at the same time. Each instrument has its own part, each has a personalized line." Indeed, perhaps the greatest pleasure of Partenika comes less from individual solos and more in how the various written parts (and ad-libbed elaborations) all fit together. One of my favorite pieces is "Small Game," which opens with Sabbagh and Filiú playing a hocket—each individual part engaged in a kind of deft relay to form a single, unified line—before the pianist jumps in with an extended solo at once skittering and utterly fluid. "Balada del Momento" thrives on an almost airless calm—that is until the pianist and Filiú improvise together, quickening the pulse and intensifying the intersecting lines. 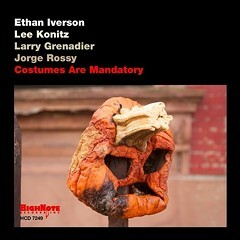 According to Ethan Iverson's liner notes the title track was influenced by some Greek street music the pianist heard near the Parthenon, but any sound she experienced firsthand has been thoroughly filtered through a modern jazz sensibility. You can check it out below.